Though the first fifteen Full Immersion students arrived last Wednesday, and the rest of the over-hundred strong student body members got to Rome’s Fiumicino airport on Friday, yesterday was the real beginning of their Umbra experience. The day began with housing: students were taken in taxis from the hotel where they had stayed and had their Welcome Dinner to their apartments up in Perugia’s beautiful historic center. Some apartments have frescoes, some have majestic views (often four flights up, but worth the sweat! ), but all are our “temporary citizens” homes for the next four months. 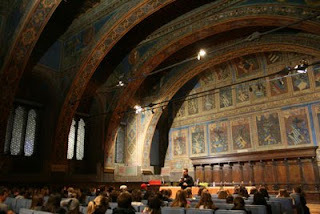 In the afternoon, after Italian placement tests, the entire student body gathered in the main hall of Perugia’s thirteenth century town hall, the Sala dei Notari, on the main piazza. There was a greeting from Resident Director Anna Girolimetti and an introduction from Elgin Eckert, the Associate Director for Academic Development. 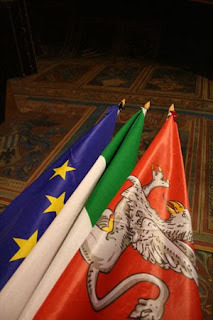 The third speaker was Officer Michele Canneschi, who talked to the students on behalf of the Italian police forces about safety and security in Italy. Today students will get additional information in their break-out orientation meetings with staff members, then ask questions during the Open House. The Umbra staff and faculty welcome the students of Spring 2011!